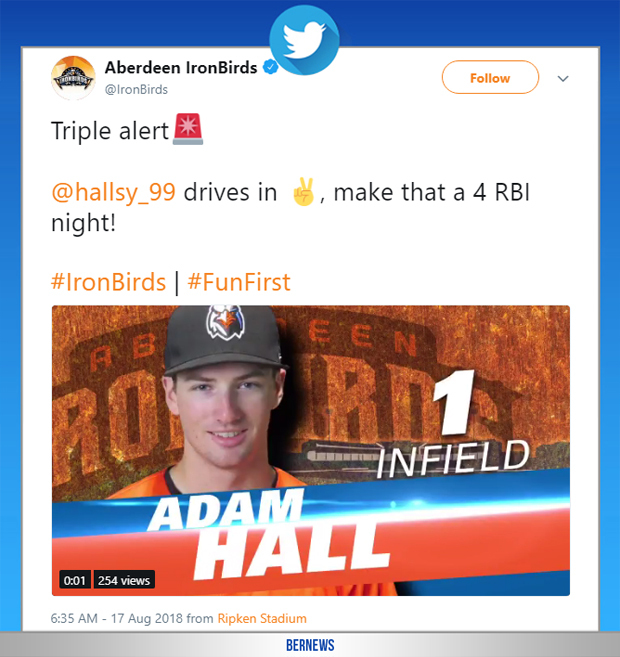 Professional baseball player Adam Hall hit a home run for his Aberdeen Ironbirds team as they recorded a 5-2 victory over the Lowell Spinners in Minor League Baseball action. The team’s report said, “Aberdeen started off the game with fireworks across all parts of it against the Lowell Spinners on Wednesday. They took a a 5-0 lead and held on to it until the seventh when Lowell scored two. Jose Diaz got his first save in a 5-2 win. “Three run first: In the first, Jean Carmona led off with a base hit. Anthony Santander walked after him. J.C. Escarra dropped a single, and after some confusion on the basepaths Carmona scored. “Santander came home on an error that put Robert Neustrom on first. Escarra scored on a double-play ball from Cody Roberts to make it 3-0. “Adam Hall drilled a homer over the left field wall on a first pitch fastball in the second inning. “Escarra to battle: With the bases loaded and one out, J.C. battled it out against Taylor Ahern. He saw eleven pitches and dropped an RBI single to make it 5-0 through two.